Dominicus van der Smissen (self-portrait). 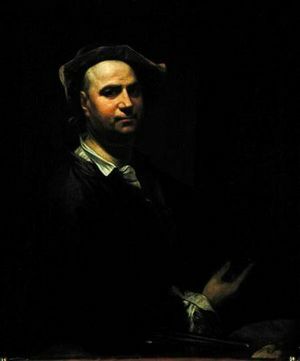 Dominicus van der Smissen: an artist, was born at Altona, Germany on 28 April 1704, a son of Hinrich van der Smissen. He was a pupil of Balthasar Denner, whose sister Catharina he married in 1730. Little is known about his life. Dominicus died on 6 January 1760. Dominicus was active as an artist at Dresden, Braunschweig, Amsterdam, and London, in addition to Hamburg-Altona. He died in 1760. Lichtwark says that a generation ago a number of his works of art were in the possession of families in Hamburg: some landscapes, portraits, and still lifes, which have become very scarce. The Kunsthalle of Hamburg possesses a considerable number of his works, including a Self Portrait (Catalog, No. 432), Portrait of the Senator and Poet B. H. Brockes (34), Portrait of the Poet Hagedorn (41), Portrait of Dr. Vincent Rumpf (165), Portrait of a Hamburg Mayor (167), Portrait of the Wife of the Mayor (166), Portrait of a Captain (433), Still Life (434), and Hinrich I van der Smissen, "The City Builder." Dominicus also painted Meta Moller, Klopstock's first wife. All the above are oil paintings. As a rule van der Smissen closely followed Denner's style, although he portrays forms of the body in greater detail. Additional paintings of his are found in Braunschweig and in private possession. The Bethel College Historical Library has colored slides and black and white reproductions of most of his works. Kunsthalle zu Hamburg; Katalog der alten Meister (1921): 155. Lichtwark, Alfred. Das Bildnis in Hamburg I. Hamburg, 1898: 144 ff. Krahn, Cornelius. "Smissen, Dominicus van der (1704-1760)." Global Anabaptist Mennonite Encyclopedia Online. 1959. Web. 21 Apr 2019. http://gameo.org/index.php?title=Smissen,_Dominicus_van_der_(1704-1760)&oldid=123614. Krahn, Cornelius. (1959). Smissen, Dominicus van der (1704-1760). Global Anabaptist Mennonite Encyclopedia Online. Retrieved 21 April 2019, from http://gameo.org/index.php?title=Smissen,_Dominicus_van_der_(1704-1760)&oldid=123614. Adapted by permission of Herald Press, Harrisonburg, Virginia, from Mennonite Encyclopedia, Vol. 4, p. 550. All rights reserved. This page was last modified on 25 July 2014, at 05:37.